BOAC's position towards the VC10 is one that has changed many times. In a way that is strikingly similar to other British designs of the sixties BOAC, being the launch customer, wrote a specification that was so specific that the aircraft that resulted from it lost a lot of the flexibilty in operations that could have meant a much larger order book. The fact that Vickers managed to deliver an aircraft that could cope with the specifications - and exceed them - is admirable. Unfortunately this view was not shared by BOAC. Even before the first VC10 had been delivered they were already complaining about the economics of the airplane. This went so far that at one point they demanded a government subsidy for operating the type! 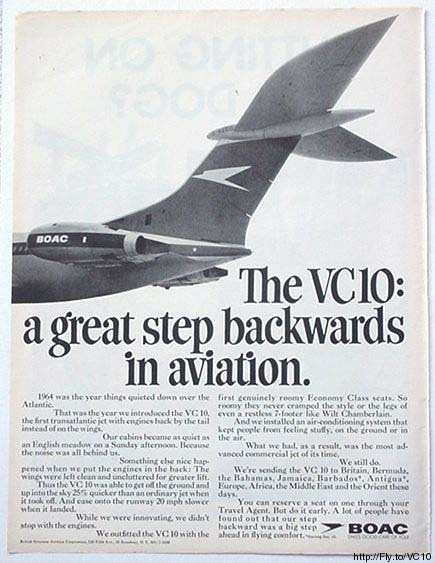 Obviously the political wrangling around BOAC's VC10 orders did not improve the sales figures of the type. 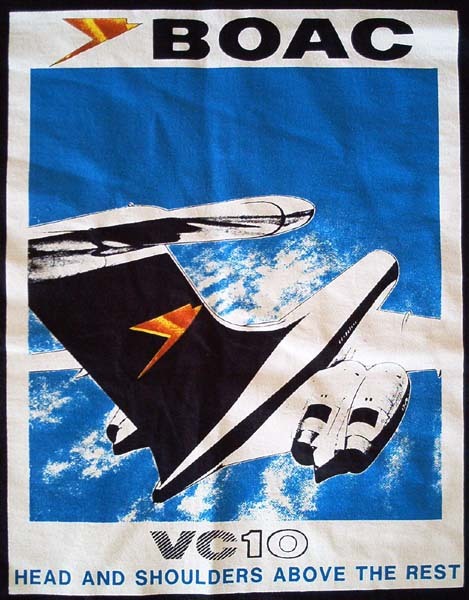 But in a strange twist BOAC noticed that the passengers actually loved the VC10, and they lost no time in exploiting this. 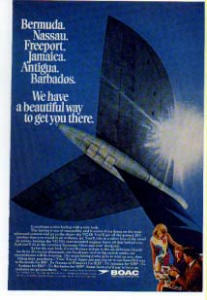 The VC10 therefore featured heavily in several advertisements, some of which are shown below to give an impression of the PR campaign that surrounded the type. The contrast between the complaints in the background and the virtues of the type as explained in the advertising campaigns is striking. Unfortunately I don't have larger pictures for all of these advertisements at this point, so apologies for the small images. If anybody can provide some large size electronic versions of these or other ads featuring the VC10 please send me a message. "Bermuda. Nassau. Freeport. Jamaica. Antigua. Barbados. We have a beautiful way to get you there." The tail of a VC10 is always a striking image and combined with the intrinsic beauty of all those sunny holiday destinations, well, it's a lovely combination don't you think? 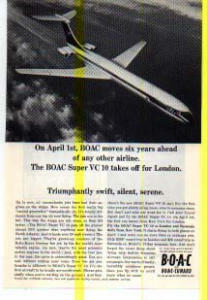 "On April 1st, BOAC moves six years ahead of any other airline. The BOAC VC10 takes off for London. Triomphantly swift, silent, serene." Indeed at its entry into service the VC10 was a technologically advanced aircraft. Another way to look at it though is that the VC10 was as many years late in appearing, as by that time many airlines had already chosen and received Boeing's 707 or the DC-8. This ad is from National Geographic Magazine and was therefore probably aimed at the American market. 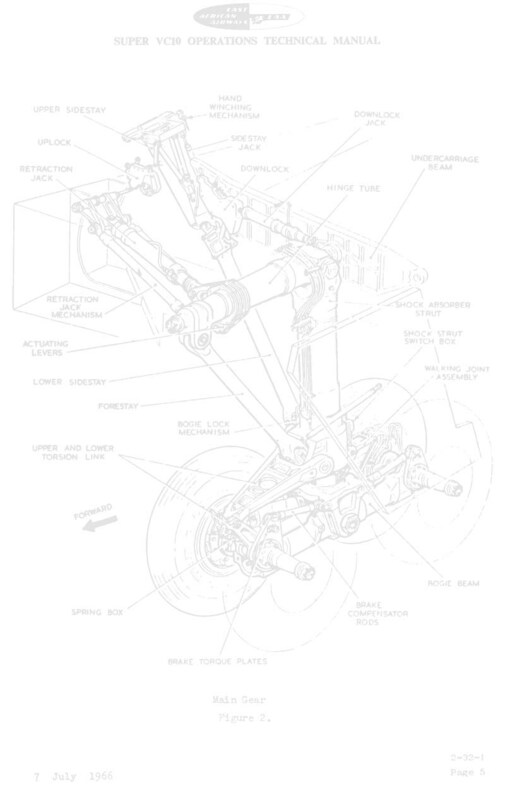 "The VC10: a great step backwards in aviation." No, this is not as bad as it sounds. What this slogan is referring to is the rear placement of the engines on the VC10. By this 'backwards' moving of the engines the VC10 gained its quiet cabin surroundings, a feature much beloved by those who traveled on it. "Stretch your legs from here to Australia. Somebody up there cares." 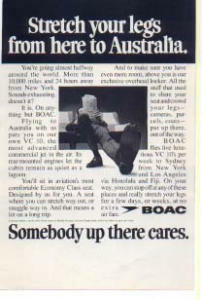 With the introduction of the VC10 on the airway routes to Australia this ad elaborated on the spaciousness of the cabin. Indeed the cabin layout was well thought-out. Something you need when you are flying long distances, especially compared to a modern low-cost carrier the legroom in a VC10 is fabulous. 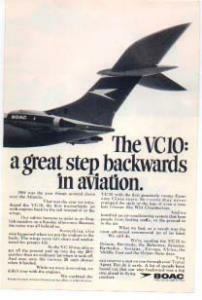 "VC10 - Head and shoulders above the rest." Well, I for one can't disagree with that. The striking lines and the mighty Rolls-Royce power of the VC10 stand out clearly in this advertisement. This image is actually from a T-shirt available from Skyshirts.com (look under International - British to find it). Originally it is from an advertising campaign sometime in the 50's according to the Skyshirts Website. My guess is that they mean the 60's but I cannot be sure of course. "A lot of airlines will fly you to Britain. But not on one of these." Well, what can I say about that. 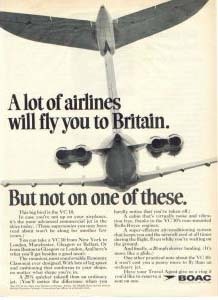 Apparently by the time this ad came out the reputation of the VC10 as a comfortable airliner was already well established. 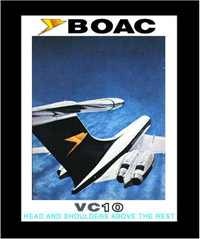 For more BOAC folders and advertisements have a look at this page: Photo Archives / BOAC and BA Brochures.